Casio G-Shock and Burton Snowboards (snowboard companies from around the world), are pleased to announce the release of the first joint collaboration! 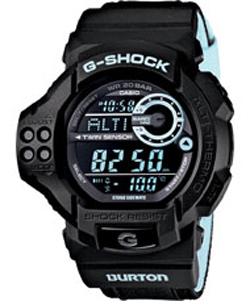 New dedicated to the 30th anniversary of the brand G-SHOCK. Collaboration Burton and G-SHOCK easily combines functionality and style. Collaborations have been used for classical GDF100 Twin Sensor, a ktoroye fit many chips, which will be useful not only seasoned extreme, but also those who work in harsh weather conditions. Newcomers GDF100BTN-1 equipped with two types of sensors, one for measuring atmospheric pressure, the other to measure the air temperature.